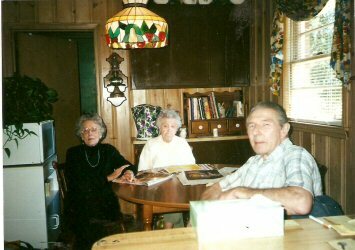 Photo snapped in 2000 shows Martha Dorcas Hallman, Ella Belle Fulks Abbott, and Martha's husband, Norman Ray Hallman Senior. As of January 2010, only Martha Dorcas Hallman and I, George Harold Fulks, are still living. Ella Belle, our mother, deceased in September 2006. Norman Ray Hallman deceased during 2009. Key to correct sequencing, research, and discussion of the ancestors and descendants of Rummage Ira and Ella Belle Abbott Fulks are to be recorded herein for personal use and for future researchers and writers. Immediate family of Rummage Ira Fulks are all present; except Kristal Vanessa Fulks Poggi. During 1999, she resided in Chicago where she worked as a manager and hairstyliest for her future husband, Peter Poggi. 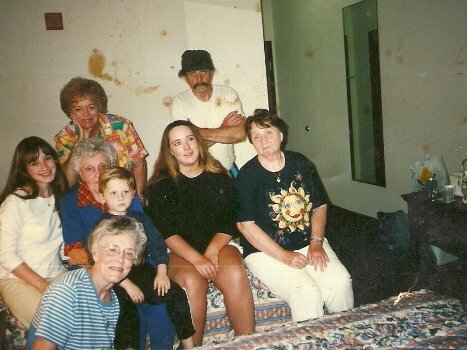 Here's a group photo of George Harold Fulks' sisters, his children and Grandchildren, and my mother, Ella Belle Abbott Fulks. Year was 1999. 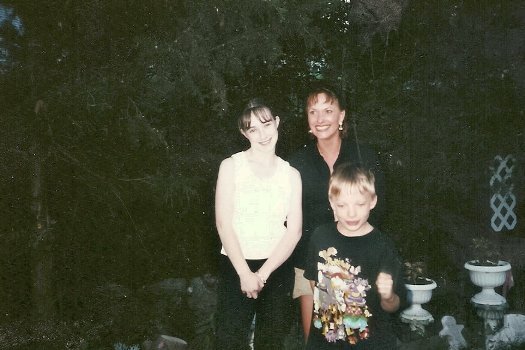 And here's Tracy Denise Fulks, Kristal Vanessa Fulks Poggi, and Kris's son, Devin Durbin. Year-about 2002. Here are all the "Fulks" keys that have been located: (1)Obediah>born 1723(2)Obediah Junior (3) John>born 1767>Virginia(the first John); (4)Henry Andrew Jackson Fulks>born 1804, Virginia; (5)John (the second one), born 1827/inherited farm from father; (6)Henry Andrew Jackson Fulks II/inherited land from John, his father/Henry died 1924/gave up his farm after death;(7)A son of Henry Andrew Jackson Fulks II, Mattie Mandard Fulks married Carie Pinegar, and they bought 180 acres along Crooked Creek, Trigg County, five miles from Golden Pond, Kentucky; (8)Rummage Ira Fulks, son of Mandard Fulks>died 1990 at age 83; (9) children of Rummage Ira and Ella Belle Fulks>Euphama Jackson, Dorcas Hallman, Betty Jean Garvin, Alice Faye, George Harold Fulks; (10)children of Euphama Fulks Jackson/Cheryl/Bruce/Darrel/Lana/Shannon; (11)children of Mattie Dorcas Fulks Hallman/Wanda Faith/Norman Ray Junior/Frank/Mark Anthony; (12)Betty Jean Fulks Garvin/Teresa/Jeanie; (13)Alice Faye/deceased 1946, age 9 years; (14)George Harold Fulks/ Kristal Vanessa, Jennifer Gail, Tracy Denise; (14)Half brother.William Colson, Trigg county, Kentucky>deceased in automobile accident during early 1960's. Did he have children, and what are their names? 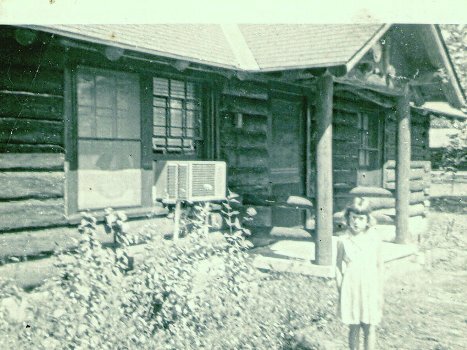 The researcher draws your attention to Martha Hallman's account of what she recalled on My great-grandmother, Sara Elizabeth Depriest.Mouse to that story if you wish to read it. A mysterious figure (a ghost of sorts) watches from the window of the Fulks house at Camp Cornelia. Located on the Eastern edge of the Great Okefenokee, the former C.C.C. was our home from 1951-1958. It was during the 1950's that a sixteen-year-old trumpet player snapped a photo of Wanda Faith Hallman, daughter of Norman Ray and Martha Hallman. The author, George Fulks, snapped this photo. My mother, Ella Belle Abbott Fulks, is at the window as a shadow. She is apprehensive in regard to her grand-daughter walking outside for reason of venomous snakes frequenting that area. Both diamondbacks and pigmy rattlers were plentiful at Camp Cornelia. These lists of Fultz/ fulks/German origin "Voltz" are listed retrogressively. Joseph Fultz[parents] was born on November 12, 1868 in Kentucky. He married Martha Hicks on April 16, 1896 in Jellico, Campbell County, Tennessee. Martha Hicks[parents]Martha married Joseph Fultz on April 16, 1896 in Jellico, Campbell County, Tennessee. Obediah Fulks Fultz[parents] was born 1n 1776/1770 in Franklin, Virginia. He deceased about 1845 in Carter County, Kentucky. He was buried about 1845 in Carter County, Kentucky. He was married to Martha Blankenship on October 16, 1787 in Bedford County, Virginia. Martha Blankenship[parents] was born about 1770 in Chesterield County, Virginia. She deceased after 1860 in Carter County, Kentucky. She married Obadiah Fulks Fultz on October 16, 1787 in Bedford County, Virginia. Obadiah Fulks[parents]was born about 1828 in Kentucky. He married Francis A.
Francis A. was born about 1834 in North Carolina. She married Obadiah Fulks. 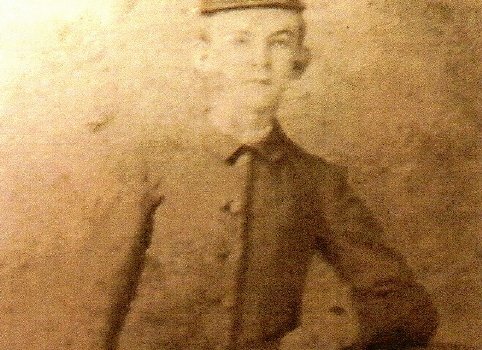 James Fulks (probably a child of Obadiah's boys) was born about 1832 in Kentucky. He married Nancy McGuire. Nancy McGuire was born about 1838. She married James Fulks. An 1850 census records that a "William A. Fulks" was a seven- year- old child counted within the household of Henry Andrew Jackson Fulks II. Is this this one whose who follows? William Fultz/Fulks[parents] was born about 1826 in Kentucky. He married Judy Keeton. Judy Keeton was born about 1827 in North Carolina. She married William Fultz/Fulks. Does the name "Obediah" have a meaning, and is it associated with use by certain groups and religious sects in Germany? The name "Obediah" is Hebrew. Its meaning is "Servant of God." Determining the sequence: Obediah, Obediah Junior,John,Henry I, John, Henry II. Rhoda Fulks, a daughter of John Fulks, was placed into the timeframe of 1810- 1830. The years are approximate. Rhoda, married to Larkin Collie, had three children. Estimated date at present(2008) is that Rhodo and Larkin were married during the mid-1820's. It was through some misfortune that both Rhoda and Larkin deceased; leaving three orphans labeled on net as infants. ("Infant" is felt a legal- term used during earlier times to identify any orphaned child under the age of six. This conclusion is only speculative.) The orphan's names were Catherine Collie, Happy Collie; and there was a boy named Asa. Documents on the net indicated that both Catherine Collie and Happy Collie were adopted by my ggggrandfather, Henry Andrew Jackson Fulks I. Records also show that Asa was first adopted by a man and family going by the name of Thurston Grubbs. Grubbs assumed guardianship of the boy for a short time. The "Grubbs" deceased. Whom the guardian was for Asa Collie after the death of Mr. Thurston Grubbs will require further research. In another case involving the Fulks family history, the setting was a court in Caldwell County, Kentucky dated 18 November 1823. Solomon Newby deceased; leaving two orphans. Listed as infants were Polyanna Newby and Patci Newby. Security for their adoption by William Bannister was Riley Newby. His relationship to the deceased, Solomon Newby,is unknown at present. Important in family history is that Polyanna Newby later became the wife of either a John Fulks or a Henry Andrew Jackson Fulks.???????? The factor involved in so many deaths during those times might have the an epidemic; such as influenza or cholera. Other diseases such as whooping cough, measles,smallpox, and diptheria are mentioned frequently as reaching epidemic proportions from 1820-1830. Available was little treatment and no cure. Hopes of recovery were often the natural immune systems of those afflicted. Cholera is most often the villian mentioned from those times. Shown is a very rare image of John Fulks, Father of Henry Andrew Jackson Fulks II/born 10-8-1827, Lyon County, Kentucky>estimated age 20 years/Image compliment of of one of his descendants now residing in California. On "google"/ John Fulks, horses": The researcher brought-up the name "John Fulks" as associated with trading in horses. John Fulks, father of Henry Andrew Jackson Fulks I, may have been involved in the breeding and sale of farmwork animals; or even into horseracing. Horses were among the most valuable property for ages. "Horsepower" is a term that define better than any other word the significance of those animals in human history. From an account shared with me by my father, Rum Fulks: "It was during the American Civil War that the Henry Andrew Jackson Fulks farm was invaded by "marauders." Whether the group were Union or Confederate supporters is unknown. My gggfather's log-home, barn, and farm were located east of Birmingham near Star Lime Works,Kentucky. Upon learning from locals of Henry Fulks I's wealth, which was $200 in cash; the group of marauders reportedly strung my gggrandfather to the cedar tree that grew near his house. They had intended to hang Grandfather from the saddle of a horse; as a custom of terrorists of those times. In this manner, my father reported that the gang were able to frighten their victim into confessing as to the location of what was considered to be a large amount of cashwealth for those times. The marauders left my gggrandfather a poor man; but he and his family were otherwise;unharmed." The author's concensus is that some "marauders" during peace and times of war are simply soldiers placed in civilian clothing. "We must travel to Chattanooga to fight the rebels or the yankees. "We can't live well on our army pay or buy the things we need to live high. You can't even buy whiskey on what we are paid. We'll have to steal what we need or seize it. "(It is likely that soldiers were sent on special missions; such as the one described above; by their commanders." When acts are performed in that manner, the rules of war do not apply. Anything goes! There were rapes, murders, burnings, looting, and outright massacres. Those kinds of terrorists may not have been associated with the war or the military; simply outlaws presenting themselves as aids to an army. That's the manner in which men can behave. Those kinds of behaviors show no quality of character at all. Henry Andrew Jackson Fulks I; husband of Nancy Polyanna Newby is placed within the timeframe of 1830. In lieu of further research, that time is relative. Known by the nickname "Jack," the Grandfather of Rummage,Seamer, Herbert, and Wilmus Avel was a successful farmer in Lyon County, Kentucky. Depending on backwater from the Tennessee River, Jack's farm received good nutrition from spring floodwater. A small, loghouse and barn offered a nostalgic landscape. Both house and barn remained intact until the mid-1950's. Across a gravel road; perhaps one hundred yards was the home of Limon Mitchuson. Just north of "Jack's" homestead and on a hillside is the Fulks Family Cemetary. Jack's Grandson, Mattie Mandard Fulks who deceased at age thirty-two is buried there on that hillside. Buried in the Fulks Family Cemetary are their son, Jethro; who deceased at age 16 years near his parents, Henry Andrew Jackson Fulks II and spouse, Nancy Emeline Mitchell. It has been determined that both Henry Andrew Jackson Fulks I and his wife Nancy Polyanna Newby Fulks are buried in the Newby Cemetary in Lyon County. The two are the parents of Henry Andrew Jackson Fulks II. Duncan Creek and the Tennessee River were good sources of foodfish for residents of "between the rivers." Some of the fish native to the water are buffalo, carp, sunperch, and three different kinds of catfish. Duncan Creek is no longer a good fishing stream for reason that it has filled with silt. "ON THE SIDELINE OF FULKS FAMILY HISTORY"
It was Frank Depriest who shared with me that Hugh, as a small child, had a habit of falling asleep atop a cracker barrel. Having observed some of the filmclips from WWI, German sniper fire and artillery were deadly. On those filmclips, I've seen several English soldiers fall as a result of German sharpshooters. (I'll try to find more information on my Uncle Hugh Fulks and post it here. Children of John Fulks and Docia Barnett Fulks were:(1) Henry Nathan; (2)Martha Polly Ann; (3)William M.; (4)Barthalama L.;(5)James Leonard; (6)Allen Nathael; (7)Aaron Calvert; (8)Frank; (9)Marina Lee Vada; (10)Lorenzo Joseph; (11)Caroline Elzada;(12)Leamie; (13)Joe Sier(Grandfather of Victoria Fulks Weber. For this researcher into the Fulks family history, the last two days have been fruitful. Especially useful has been the Gen Investigation conducted by Sara Ann Roepke and the subject, Obadiah Fults-Fultz. She has been very successful, and I am grateful for her contribution; especially for the reason that my father, Rummage Ira Fulks made at least one visit to Virginia for purposes of finding his ancestors. His greatest disappointment was to learn that the court houses there in Virginia had burned-down. He felt that all of the records of our ancestors had been lost. Sara Ann Roepke found other sources of information. These were above and beyond courthouse records. Neither my father, Rum Fulks or I, his only son, George Harold Fulks, were able to penetrate far into the unknown. Thanks to Sara Ann Roepke, a whole, parallel has emerged. The name "Obadiah Fulks-Fults-Fultz had occurred so frequently that I, George, suspect that the name may have been used to apply to several different individuals in order to disguise the location and identity of the real "Obadiah." Possible is that one Obadiah was on a religious assignment; and that it was important that the "real" Obadiah Fulks remain unknown. The establishment of the Church of the Latter Day Saints within the New World may have been among the reasons. There was talk from my father that one of his ancestors was a Mormon Preacher. This time, this place, this shelter, this space. They're only here for us to use. Just for a breath and just a sigh. Only a man am I. 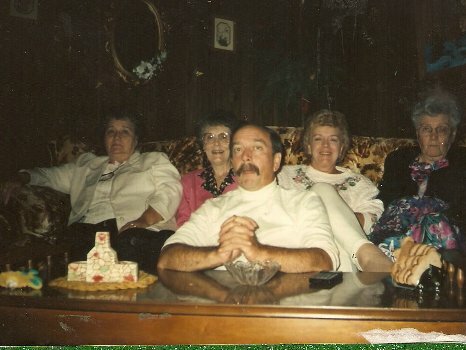 The Fulks to whom we know our direct ancestry hailed from Wuerttemberg, Germany. They are directly linked to John Fultz/Fulks and Nancy Newby. The original spelling of our surname was "Voltz," which means "people nation." The Volks wagon of German origin bears this label. Lorenzo Fulks, father of Roy Fulks, is within the photograph from 1900 of members of the class of 1900(Old Ironton School, Kentucky) To view that photo "google" to "All Stories" Rummage Ira. Then Choose "Route 2, Golden Pond, Kentucky."